Reporting from Johannesburg, South Africa, on election day 2014, Exeter’s Emily Bridger argues that the African National Congress’s continued political success owes much to its use of the past and the memory of Nelson Mandela. Today, South Africans will go to the polls to vote in their country’s fifth democratic general election. South Africa’s political atmosphere has, since 1994, been characterized by the stubborn persistence of political allegiances, and a deep feeling of loyalty and indebtedness towards the African National Congress, the party that liberated its people from the oppressive conditions of apartheid. This year’s election carries particular historical significance, as it not only marks the twentieth anniversary since the end of apartheid but also the recent passing of the country’s political father figure, Nelson Mandela. 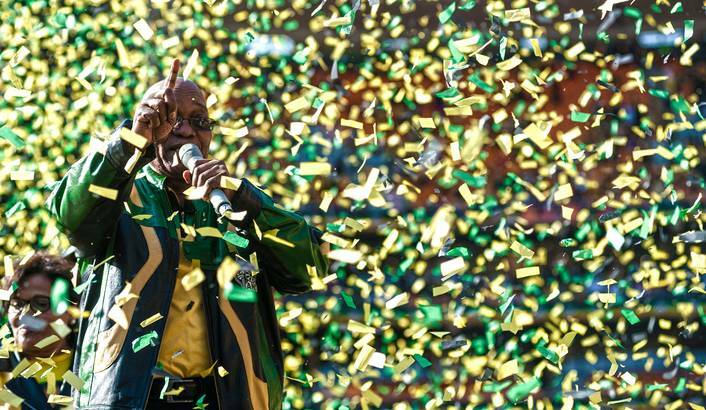 While previous ANC election campaigns have focused on the hope for a better future, this year’s campaign has made a decisive rhetorical turn to the past. Likewise, to understand the ANC’s continued success, we must look to the party’s past progress rather than its present scandals. The results of the election will in all likelihood be unsurprising. The ruling party, the ANC, is expected to win 60 percent of the vote, only a 5 percent decrease from the country’s last election in 2009. Meanwhile, the official opposition party, the Democratic Alliance (DA), is predicted to gain 20 percent of the vote, and the country’s new left-wing party, the Economic Freedom Fighters, securing 5 percent at most. The uncanny resemblance of these figures to those of the 2009 election, in which the ANC secured 65.9 percent and the DA 16.7 percent, may seem surprising given the numerous abuses and excesses the ANC has been accused of in recent years. In August 2012, police response to a miners’ protest at Marikana left 34 people dead, in the most lethal use of force by South African security forces since apartheid. More recently, the president himself, Jacob Zuma, has been accused of spending R250 million (£14 million) of taxpayer money for security improvements to his private home in Nkandla. Meanwhile, unemployment has risen to 36 percent, corruption remains rife, and the gap between the rich and the poor continues to widen. President Jacob Zuma spoke on Sunday at Soweto’s Soccer City stadium in Johannesburg, the same place where Nelson Mandela spoke two days after his release from prison. It will come as little surprise, then, that the ANC this year is running on its less tarnished past, and on the memory of Nelson Mandela. History in South Africa has long been used as a means of ideological mobilization and continues to play an important role in collective identity. This year, the ANC has not called on the people of South Africa to vote for them because of their successes in leadership since 2009. Rather, in numerous recent rallies, the ANC has reiterated its campaign slogan of having “a good story to tell,” and has focused voters’ memories on its past successes in bringing about an end to apartheid rather than its more recent record. Similarly, posters stapled to telephone polls across Johannesburg urge voters to “do it for Mandela”. This past Sunday, the ANC held its final political rally in Soweto’s FNB stadium, a location rich with historical significance. It was here that Mandela first spoke to his people following his release from prison in 1990, and it was here that Mandela’s life was commemorated at his memorial this past December. Rather than apologizing for recent political blunders or promising to rectify government mistakes in the future, Zuma concluded his speech on Sunday by invoking the names of his party’s famous heroes, calling on people to vote for Nelson Mandela, Oliver Tambo, Chris Hani, and others. The ANC’s retrospective message has taken a more sinister note in a number of the country’s rural provinces. At the launch of the party’s manifesto in the Eastern Cape in January, Zuma stated that those who leave the ANC for other parties “will attract the wrath of the ancestors, who will also bring that person bad luck.” The DA has also focused much of its recent efforts on stressing its strong anti-apartheid credentials, highlighting the history of struggle heroes who did not belong to the ANC. In response, the ANC chairperson in Limpopo declared that the DA is “bent on bringing back the legacies of oppression.” In a direct reference to the history’s influence over voters, the chairperson continued, “Our masses, young and old, know their history too well. They cannot be fooled nor allow themselves to be betrayed.” In a recent survey of 3009 South Africans between the ages of 15 and 34, more than half of black respondents stated their belief that if elected, the DA would bring apartheid back to South Africa. Some have heralded this year’s election as a turning point in the country’s political history, as a new generation of “born frees” – those born after the end of apartheid – can now vote for the first time. While the influence of the ANC’s legacy on this generation remains to be weighed, it is unlikely that they will vote for an opposition party simply because they did not experience the struggle against apartheid. Political scientists argue that when predicting how a person will vote, the most important factor is not their ethnicity, religion or economic status, but how their parents voted. The historical legacy of the ANC may thus continue to sway South African voters for at least a generation to come. In a country where the legacies of apartheid continue to dictate people’s lives, where history plays a central role in the formation of collective identity, and where a belief in ancestors prevails amongst so many, it may not be surprising that the past weighs heavier than the present in the minds of many South Africans casting their vote today. While the ANC’s historically tinted election strategy may help to secure their victory, they should also be wary of dwelling too much on the past. For, as a Business Day journalist stated, “Once a party stops looking into the future, it stops being able to offer hope” – something that many South Africans desperately need at this important milestone in the country’s history.